LocoRoco Wallpaper: . : We're still rolling :. Minitokyo »	LocoRoco Wallpapers » LocoRoco Wallpaper: . : We're still rolling :. I was thinking about a new wall and he came up with the idea of making a new LocoRoco Wallpaper. Good for me, cause I hate giving titles to my walls. Overall this wall is made with graphic tablet and mouse. Some parts are vectored most of the wall is handdrawn with the tablet. I liked the colors a lot and by looking at the original pic I felt somehow better. It's very cheerful and I wanted to show that in that wall. Anyways great job with the wall. the colors are so pretty, and it's just adorable! ^^ I really should check out this game some time. Hehe! Cool! 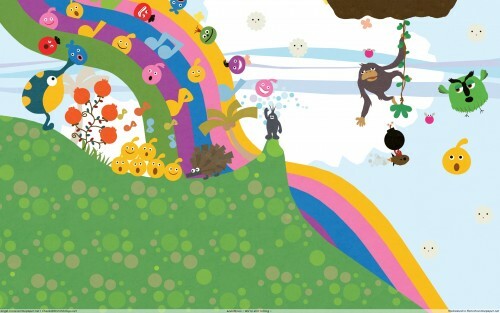 Its a LocoRoco wallpaper. Cool! A really cute one! Wow! Love the game! love the wallpaper! Thanks for making this!